It's Friday again! I can't believe how fast the weeks are flying by lately… a week from today will be Geoff's last day of work. And yes, I'm totally panicking about that. I think I've been really spoiled by having so much consistency in our married life. Geoff has had the same job for eleven years! I know other people change jobs and everything works out fine (and I'm sure it will for us too!) but it feels like the bottom is dropping out for us. Wish us luck! All that being said, I've been doing lots of stress baking lately, and these pretzels are a new favorite! When we were in San Diego we visited Wetzel's Pretzels for the first time, and I totally fell in love. I love how crisp and chewy the outsides of the pretzels are and how the dough is soft and lightly sweet. 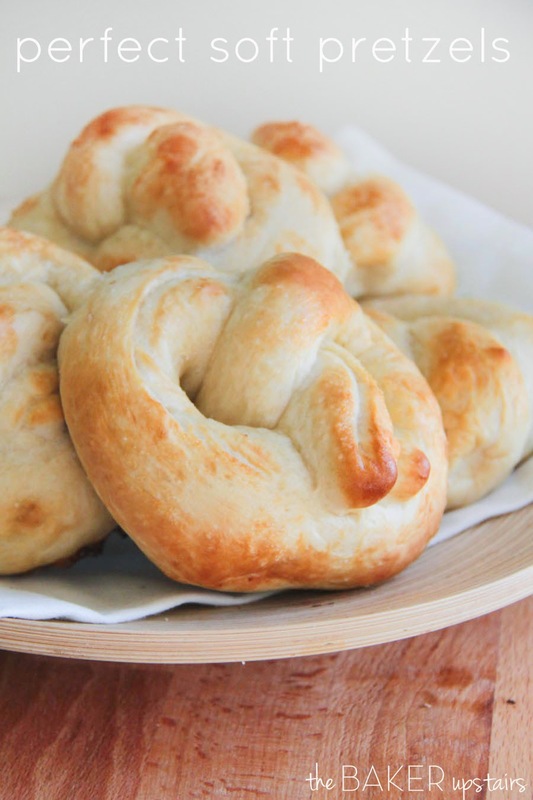 Pretzel perfection! When we came home I wanted to find the perfect copycat recipe, and here it is! Don't be dissuaded by the fact that my pretzels are fat and puffy instead of skinny and twisted. I just can't shape pretzels correctly to save my life. :) No matter how thin and long I roll my rope, it always seems to turn into a fat little pretzel shape. But you know what? That's actually okay with me, because it means I get to use them as pretzel buns for sandwiches too! We used these for some awesome turkey sandwiches the next day, and they were fantastic. I can't wait to make these again! In a large bowl or the bowl of a stand mixer, dissolve the yeast in the warm milk. When the mixture is bubbly, mix in the brown sugar, butter, one cup flour, and salt, and mix until combined. Add the remaining flour, one cup at a time, and mix until a smooth and slightly sticky dough forms. Cover the bowl with plastic wrap and let rise about one hour, until doubled in size. After the dough has risen, preheat the oven to 450. Line two baking sheets with parchment paper and set aside. Divide the dough into twelve equal sized pieces, and roll each piece into a long skinny rope. 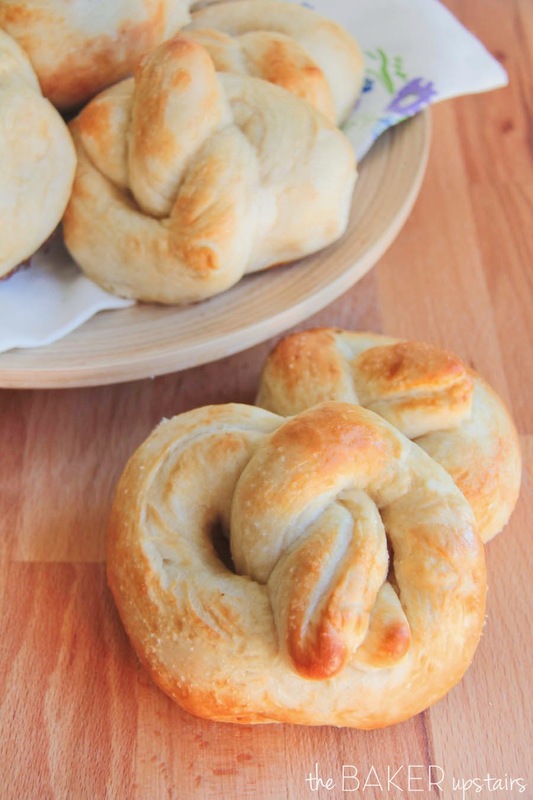 Twist into a pretzel shape. In a medium bowl, mix together the warm water and baking soda until dissolved. 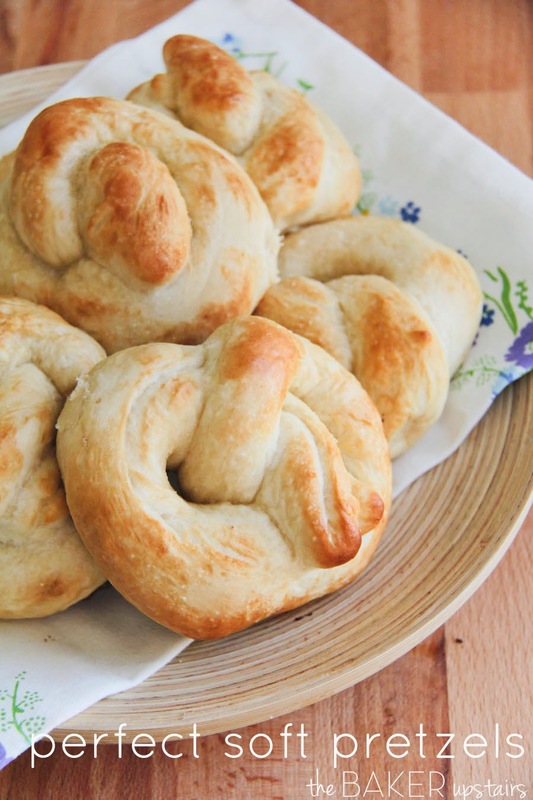 Dip each pretzel into the baking soda mixture and place on the prepared baking sheets. Sprinkle with salt. Bake 7 to 11 minutes, or until golden brown. Remove from the oven and brush with melted butter. Mmmm, I love pretzels! These look amazing!